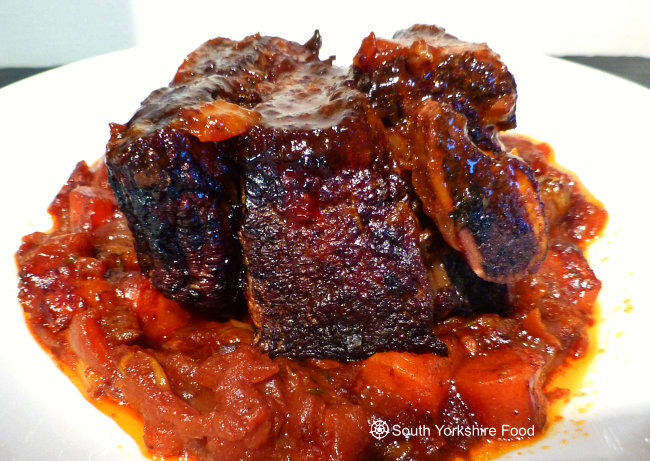 Beef short ribs are much more tender and meatier than the more common pork variety - spare ribs. The ribs are larger, usually with a 5-8cm piece of bone, and a large juicy chunk of meat. One of the best, and most flavoursome, ways of cooking shortribs is to braise them in wine and stock. Serve these succulent ribs with creamy mash potato and some steamed greens. Serves 4. Heat your oven to 200°C/180°C fan/400°F. Next tie a loop of string around the bone and meat of each rib portion. The ribs tend to expand and fall apart when you braise them and the string will hold them together. Put the ribs in the oven on a shallow tray and roast then for about 20 minutes to seal and colour the meat. Meanwhile, in a flame proof casserole dish, sauté the onion in a tablespoon olive oil for about 5 minutes until softened. Next add the carrot and celery, mix well, and cook for another 5 minutes. Now stir in the tomatoes, garlic, balsamic vinegar, tomato purée, and honey. Add a good seasoning of salt and black pepper. Pour in the beef stock, wine, thyme and bay leaf, and bring to a gentle simmer and cook for 5 minutes or so. By this time the beef short ribs should be nicely sealed so remove them from the oven and place them in the casserole. The liquid in the casserole will not completely cover the meat - this is fine. Turn the oven down to 150°C/130°C fan/300°F. Add the uncovered casserole to the oven and cook for 2 hours. About every 20 minutes check the level of liquid in the casserole, if it is looking a little dry stir in a splash of boiling water. Also turn the ribs occasionally so they get a nice colour all over. After 2 hours the ribs should tender and succulent - check the seasoning and serve with creamy mash potatoes and steamed greens.